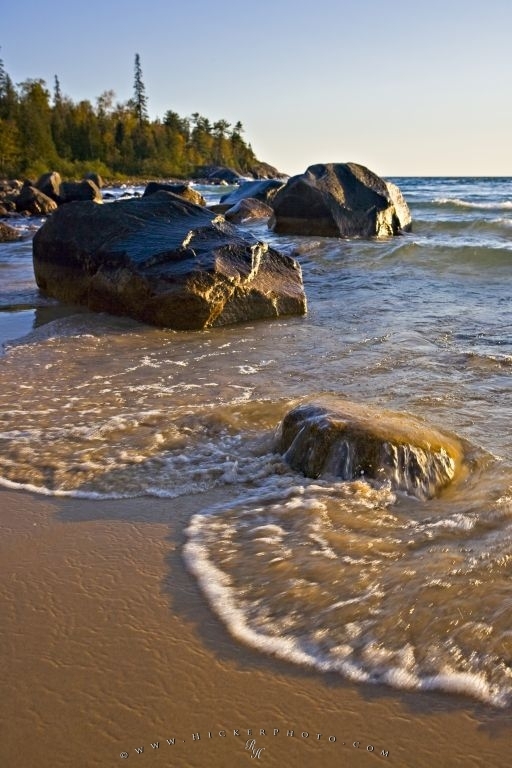 Some of the Great Lakes landforms include the curve of the beach, the land jutting out into the lake and the natural valleys created by the movement of the water. This beach is located at Katherine Cove, which is one the shores of Lake Superior in Lake Superior Provincial Park, Ontario, Canada. Lake Superior is one of the Great Lakes of Canada and the USA. One example of a landform is any view that includes a body of water, or the sea. The most interesting landform is one that has many levels and textures and shows the natural movement of the elements. The way the water is flowing over the rock in the foreground shows how the water is rushing over the rock and then pulling back as the waves roll into shore. Beach at Katherine Cove, Lake Superior, Lake Superior Provincial Park, Great Lakes, Ontario, Canada. Picture of some typical landforms along the shores of the Great Lakes such as Lake Superior.